← PVR most trusted in entertainment; Salman ranks second. India, 3rd February 2012: Telecom is important in India, and it keeps in the news one way or the other. Supreme Court’s recent order cancelling 122 licenses has indeed raised deep trust-related issues about the stakeholders involved in the troubled telecom brands. An interesting viewpoint is seen from the influencer-consumer point that is reflected in a study on Brand Trust conducted by Trust Research Advisory (TRA) from 15 cities and 2718 respondents. The research study titled “The Brand Trust Report (BTR), India Study, 2012”, compares Brand Trust on a proprietary 61-component matrix of TRA. N. Chandramouli, CEO, Trust Research Advisory, publishers of the BTR 2012 commented on the development and said, “The Indian telecom growth is nothing short of a revolution and this growth has invisibly but tangibly impacted the growth of business and social connections in India. In fact, telecom has left no life untouched. The recent Supreme Court judgment will definitely impact the consumers, but the bigger and deeper damage has been done to the trust that these brands evoke. The Brand Trust of the impacted brands is bound be severely affected.” Unaffected by the recent troubles of the sector, the trust leaders in the mobile telephony have retained their last year’s leading ranks. Airtel (ranked 1st) continues to top the list, Vodafone ranks 2nd and Idea ranks 3rd in the list of 18 telephony brands that emerged in the search for India’s 1000 Most Trusted Brands. The brands which feature among India’s 1000 Most Trusted Brands have had their licenses cancelled. 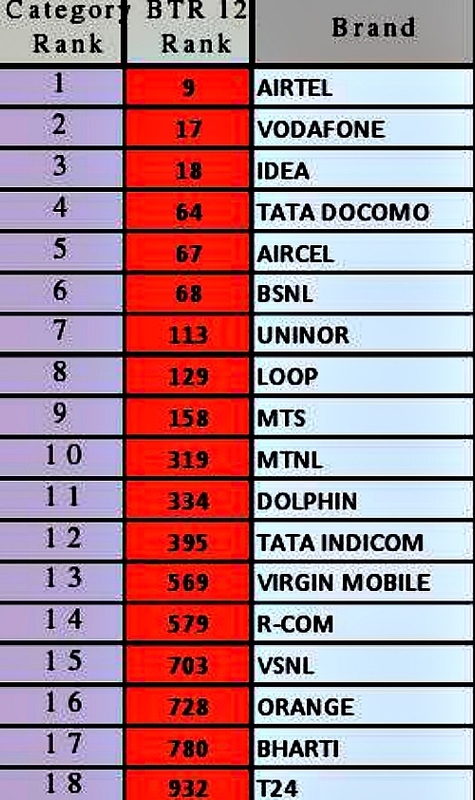 The telecom category has a high Category Trust and the brands which feature include Uninor (BTR ranked 113th), Videocon (not ranked among telecom), S Tel (not ranked), Loop Telecom (BTR ranked 129th), Etisalat (not ranked), Sistema (not ranked), Idea (BTR ranked 18th) and Tata (Tata Docomo ranked 64th and Tata Indicom ranked 395th). The Brand Trust ReportTM is priced at Rs. 10,000/- and is available in major stores and at the offices of Trust Research Advisory. Trust Research Advisory (TRA), a part of the Comniscient Group, is a company dedicated to understanding and simplifying concepts related to Trust. TRA was conceived in 2008 to decipher, analyze and measure Brand Trust, to make it universally understood and easily applied. The organization’s focus areas include Research, Publishing, Trust Training, and Licensing. Trust Research Advisory, is committed to bring forth concepts/ideas to bring out “Trust” in all its manifestations that shall redefine Branding, Marketing Communication and the Behavioural Sciences. The Brand Trust Report, India Study, 2012 (ISBN:978-81-920823-1-8), is the result of a primary research based on the proprietary 61-component Trust Matrix. TRA’s Trust Matrix has resulted from several hundred hours of research with sociologists, communication experts and behavioural scientists. This year’s research was conducted among 2718 ‘influencer’ respondents across 15 cities. The study, the most intensive undertaken on Brand Trust across the globe. The study generated nearly 2 million datapoints and 17000 brands and was conducted across 15 cities. Indian Statistical Institute helped create a statistically robust Brand Trust Index which has been used to hierarchically rank India’s brands on the basis of trust. This report is the second in the series initiated in 2011.